Being in Berlin for just three days means that you have to consider what to see. I was determined before I left to visit the Pergamon museum and see the remains of the Pergamon altar and the Ishtar Gate from old Babylon. You can easily walk around in the museums on the Museums Insel for a week. 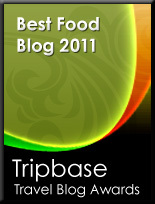 I do recommend that you browse around the net and decide what you would like to see. 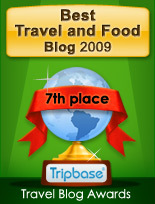 I decided to go back to the Mesopotamia, the land between the rivers Euphrates and Tigris. The Museum Island is located in the old East Berlin, on an island in the river Spree that runs through the German capital. Here you find a great number of museums, among them the Pergamon Museum, that is one of the newest museum on the Island, completed in 1930. 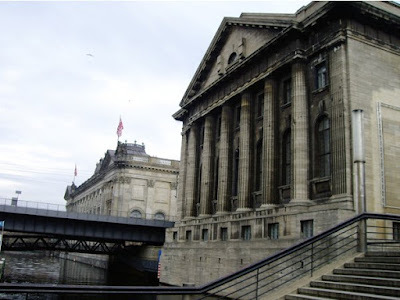 The Pergamon Museum is named after one of the treasures, the Pergamon Altar. 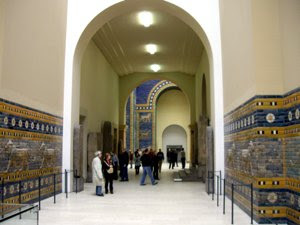 In the other wing of the building you find the treasures from Old Babylon, the Ishtar Gate and the Procession Road constructed in 575 BC by king Nebuchadrezzar II. The Darwaza D'Ishtar, بوابة عشتار was the eighth gate to the inner city of Babylon and was considered as one of the seven wonders of the antiquity. The exhibition of the Pergamon Museum is partly a new reconstruction and partly made up of fragments found by the German archaeologist Robert Koldewey. Here you may walk through the famous walkway up to the old gate. The gate and the walkway are covered by the most brightest blue glaze and depicts images of amazing quality. 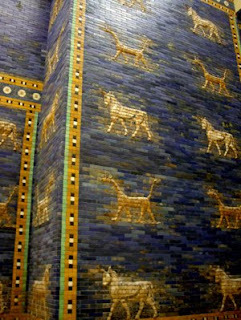 The Ishtar Gate was decorated with bright blue tiles and images of real and imaginary wild animals as bulls, dragons, and lions. It is truly amazing to walk along these remains from what once used to be of one of the most amazing and remarkable cities in the old world. 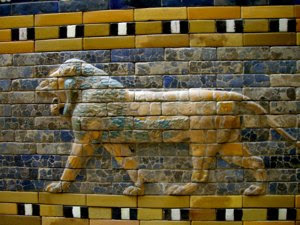 I was thrilled by the images on the old tiles animals as this lion. So graceful and realistic, as the once I had seen just a month ago in South Africa. Remains of the gate are found in other museums in the world, in Turkey, Sweden, and in several museums in the United States. If you consider going to the Pergamon Museum, do so. The reconstructions and remains that survived the Second World War is one of the highlights of my stay in Berlin, with the other monument in the museum - the Pergamon Altar, that I will return to later.